Treatments can enhance diamond quality. Purchasing treated diamonds is an option that some couples consider simply because it may help them afford a diamond engagement ring. A treated diamond has been altered to make its appearance more alluring, appealing, and pleasing. There are basically two types of treated diamonds, synthetic, and natural. Diamonds are usually treated to make them more attractive to the eye or remove small fractures or minor imperfections like foreign material. Treatments can enhance color, clarity, or both. Clarity is enhanced by filling techniques (fracture or laser), while color is affected by treatments like coating, irradiating, or high-pressure high-temperature (HPHT) treatments. Coatings are not permanent, but the other treatment methods are considered to be. However, according to Beyond 4Cs, there is concern about the lasting effect of color treatments on diamonds. Some drawbacks for consumers to consider before purchasing treated diamonds are resale value and ease of resale. While it may be less expensive to purchase a treated diamond, they typically do not increase in value the way a naturally colored diamond would. In fact, the value may drop significantly, and it may be time consuming and labor intensive to resell such a stone. There are basically two main treatments for enhancing the quality and value of a diamond, and these include changing its color and filling its cracks to hide diamond flaws and inclusions. To enhance or change colored diamonds, several techniques can be used. HPHT: This is the process of combining high pressure with high temperature. This technique may make a diamond more colorless, or it may create a pink, brown, yellow, or blue diamond. The resulting color will rely a lot on the original state of the diamond. Heat Treatment: When black diamonds are desired, they can be produced by taking a lower quality diamond and exposing it to very high temperatures for a period of time. Irradiation: Black, green, and blue diamonds can be created by exposing the diamond to radiation. Irradiation and Heat Treatment Combined: First, the diamond is treated through radiation, and then it is exposed to high temperatures. Diamonds which are purple, pink, blue, yellow, and brown can be created in this manner. Coating: This practice isn't as commonly used today, but it involves the coating of the stone to improve its appearance. This technique was invented in 1982 by an Israeli diamond cutter. A molten glass-like substance is inserted into the small cracks of diamonds, and this can improve the diamond's clarity. This will only work, however, on a diamond that has small cracks. At times, bromine instead of molten glass is used to fill the cracks. While this may be a less expensive process, it may also cause the stone to discolor after a period of exposure to the sun. Sometimes, a laser is also used to inject acid into the cracks to bleach them. Before you purchase any diamond, be sure to ask the jeweler if it has been treated. If a diamond is sold as untreated, then you should be issued a certificate verifying this fact. If you are intentionally buying treated diamonds, you should ask the jeweler to write down the specific details of the treatment, any necessary care that should be given to the stones, and any type of guarantee the company offers, such as repairing a treatment that has become damaged. 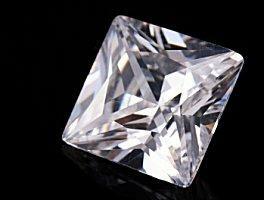 Finally, it is always a good idea to take the diamond you are purchasing to an independent appraiser. Be sure you have an agreement from the seller that you can return the diamond for a refund if the appraisal doesn't satisfy you.